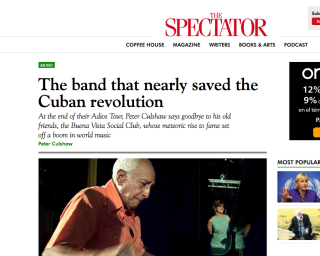 Journalist Peter Culshaw says goodbye to his old friends, the Buena Vista Social Club, whose meteoric rise to fame set off a boom in world music. Last August he a grand UK finale at a sold-out Royal Opera House. The concert was tinged with sadness. There were short, beautifully assembled films of the deceased members. Continue reading here.